On a Seine River cruise, you most always begin and end your trip in Paris, where ships dock within walking distance of the Eiffel Tower. Cruises are usually roundtrip to Rouen, Caudebec-en-Caux or Honfleur. You should note, however, that few vessels can actually make it to the center of Honfleur for docking. Monet’s gardens in Giverny. Visiting Monet’s gardens is like walking into one of his impressionistic paintings. You can get to the gardens by bus or by bike. We chose to bike on one our visits – recommended if you’re an active traveler. Have your camera handy – and your sketch pad if you’re an aspiring artist. 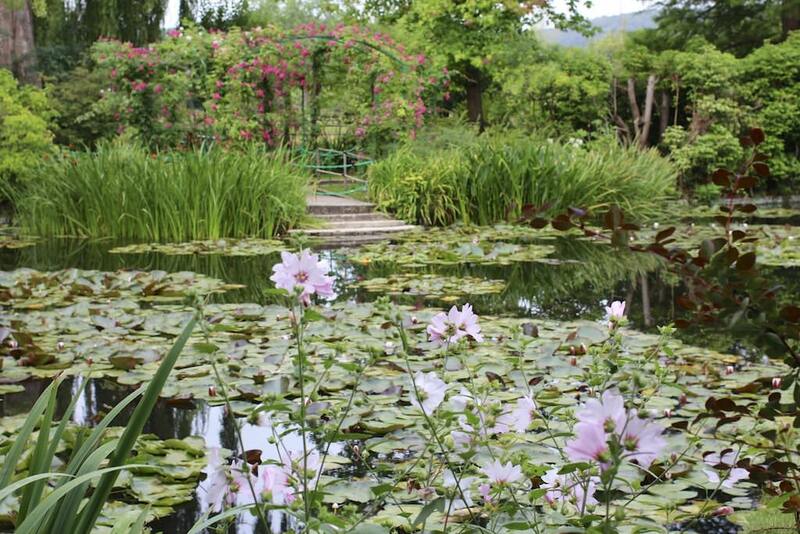 See Impressions Of An Impressionist’s Gardens In Giverny and Vernon & The Art Of Claude Monet. The Landing Beaches of Normandy. Most Seine River cruise itineraries list Normandy as a destination. However, travel to Normandy is by motorcoach rather than riverboat. I traveled to the Landing Beaches from Rouen, about 90 minutes away, with my teenage son. We watched “Saving Private Ryan” on our iPad on the way to the American Cemetery. See A Trip To The Landing Beaches & A Stunning Discovery At The American Cemetery. Honfleur. The extremely picturesque port inspired many well-known artists. It will inspire you to raise your camera – many times. A must see. The Seine River begins in the Burgundy region of France about 20 miles northwest of Dijon. It flows in a northwesterly direction for 482 miles before emptying into the English Channel at Le Havre and Honfleur. The Seine is indirectly connected to the Saône River through the Yonne River and Burgundy Canal. Only barge riverboats or other smaller vessels can traverse the waters between the Seine and Saône, though. On the western portion of the river, the Seine is considered navigable for some ocean-going vessels from the English Channel to the city of Rouen. Many bridges cross the Seine River. The Pont de Normandie Bridge connects Le Havre and Honfleur; and in Paris, the Pont Neuf is one of the city’s 37 bridges over the Seine. Pont Neuf was built around the beginning of the 17th century and is the oldest bridges in Paris. In 1991 UNESCO added The Banks of the Seine in Paris to its list of World Heritage Sites. Although, the Seine is a winding river from Paris to the English Channel, most of the sites and scenery are historical, cultural or archaeological in nature rather than in the form of the beautiful landscape you’ll see on some of the other rivers in Europe. There are two companies that do not travel on the Seine River – A-ROSA and Emerald Waterways. The average itinerary length for a Seine River cruise is 8 days. Packages that combine other river cruises can be up to 23 days. The most common cruise is on the Seine, Rhône and Saône. Also see Seine River Stateroom Size Comparisons | How Do Seine River Cruise Prices Compare? | What’s the Best Choice for a Seine River Cruise? This information is intended to give you an overview and a general idea of what different river cruise companies offer. With regard to itineraries – they change from year to year and sometimes within a year. The number of itineraries listed for some of the companies does not include reverse itineraries for packages that combine the Seine River with other waterways. For example, a reverse river cruise from the Seine and Rhône from Paris to Avignon would be from Avignon to Paris. Comparative summer 2018 pricing for Seine eight-day to 11-day river cruises in similar staterooms across operators on the Seine. I looked for staterooms of equivalent size and features, namely those with French balconies or step-out balconies. CroisiEurope's two ships on the Seine feature only 140-square-foot staterooms with fixed windows that open, which for some travelers, would suffice. Prices were obtained from cruise company websites and may not reflect current incentives. Additional charges were estimated in some cases, such as for laundry and beverages, and obtained from the cruise company websites. * Viking includes at least one shore excursion in each port of call, with optional excursions for a fee. ** To calculate the value of included roundtrip economy air, I used Viking's $1,595 per person published rate from select gateways in North America. AmaWaterways features cruises on the Seine River roundtrip from Paris to Caudebec-en-Caux with an excursion to the Normandy Beaches. The company does not have packages that combine the Seine with any other river cruises. Avalon Waterways features Seine River cruises from Paris to Caudebec-en-Caux, which is located between Rouen and Honfleur. Cruises on the Rhone and Saone rivers are between Chalon-sur-Saône and Arles. Travel between Paris and Dijon is by high-speed TGV train. Transportation between Dijon and Chalon-sur-Saône is by motorcoach. Read Ralph Grizzle’s Avalon Creativity Cruise Review: Seven Days On The Seine, Does Avalon Measure Up? Interesting to Note: Avalon Waterways is the only company that includes Côte d’Azur in its Seine, Rhône and Saône river cruise packages. Interesting to Note: CroisiEurope offers Seine River cruises from into the hearts of Honfleur and Paris. No other river cruise vessels dock in Honfleur or cruise into the heart of Paris, past Notre Dame cathedral. Read about Ralph Grizzle’s evening cruise into Paris. Emerald Waterways does not offer cruises on the Seine River. Riviera River Cruises does not offer cruises on the Seine River. Scenic Cruises has an itinerary for the Seine River and another one that combines the Rhône and Saône rivers. Embarkation for the second cruise is in Chalon-sur-Saône. Transportation is provided by high-speed TGV train from Paris to Dijon and motorcoach from Dijon to Chalon-sur-Saône. Interesting to Note: Scenic Tours is one of the only companies that includes a trip to Versailles in the Seine River cruise package. Tauck offers a few different options for the Seine River. Two of the itineraries are roundtrip from Paris to Honfleur. The other option is a cruise on the Seine between Honfleur and Paris with travel to or from London. Whether your trip begins or ends in London will determine the direction of your river cruise. If you depart from Paris, you will travel from Calais, France to Folkestone, England via the EuroTunnel. From Folkestone you will be transported to London. If your trip begins in London, the reverse will apply. Interesting to Note: Tauck has two itineraries the combine a cruise on the Seine with a tour of London. It is the only company that includes travel on the Eurotunnel between France and England. Uniworld features river cruises on the Seine River from Paris to Caudebec-en-Caux. Travel to Normandy Beaches is by motorcoach from Rouen. And travel to Honfleur is by motorcoach from Caudebec-en-Caux. The company also has two packages that combine a cruise on the Rhône and Saône with the Seine River.You will be transported via high-speed TGV train between Paris and Lyon, depending on the direction of your itinerary. Lyon is located at the confluence of the Rhone and Saone Rivers. It is where your cruise on the Rhône and Saône rivers will begin or end. Lyon is located at the confluence of the two rivers. A visit to Macon, France is the only other destination visited on the Saône River. It’s about 45 miles north of Lyon. The remainder of the cruise is on the Rhône River. The other package, Ultimate France, combines a cruise in Bordeaux on the Dordogne and Garonne Rivers and the Gironde Estuary. Travel between Paris and Bordeaux is by motorcoach. River cruises for this package are on the 1) Seine River; 2) Bordeaux; 3) Rhône and Saône Rivers if your trips begins in Paris or the reverse order if your trip ends in Paris. Interesting to note: Uniworld is the only company that combines three river cruises in one package. Viking River Cruises keeps its package options simple. There are two different cruises. You can take a cruise on the Seine River, or you can take a cruise on the Seine River and a second cruise on the Rhône and Saône rivers. Boarding takes place on the Saône River in Chalon-sur-Saône, which is about 80 miles north of Lyon. What’s the Best Choice for a Seine River Cruise? The best choice really depends on your budget, how much time you have to travel and what destinations you would like to see. If you take a cruise on the Seine River only, Honfleur is the farthest port from Paris. That will allow you to experience the longest cruise in terms of distance. However, only CroisiEurope sails into Honfleur. The other companies transport guests by motorcoach from Le Havre or Rouen to Honfleur. If you have at least two weeks to travel, a combination of the Seine, Rhône and Saône rivers is a good choice. An itinerary to or from Chalon-sur-Saône will allow you to experience more of the Saône than a cruise to or from Lyon. Read more Seine River Cruise articles.